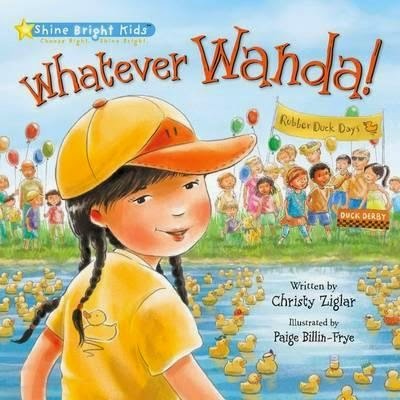 Whatever Wanda! teaches children the importance of having a good attitude. Wanda is in serious need of an attitude adjustment! She doesn't want to accompany her family to the Rubber Duck Days Festival, and once there, she won't participate in any of the events or join in with her friends. Soon Wanda receives some helpful advice and learns that: 'Sometimes you have to believe something will be great before it actually is. Being positive is a choice that makes everything better, not to mention, a whole lot more fun!' About Shine Bright Kids: Choose Right. Shine Bright. The Shine Bright Kids series provides children and their families with the tools to teach the importance of making good choices. The series explores such topics as: using good judgment, taking responsibility, having a positive attitude, and demonstrating perseverance. In accordance with FTC's 16 CFR Part 255. Many thanks to Propeller Consulting, LLC for providing this prize for a giveaway. Choice of winner and opinions are all my own. I received a sample of this product for an unbiased review. Winner is subject to eligibility verification.